Legendary mountaineer Doug Scott give a fascinating insight into how a lad born in Nottingham during the darkest days of WWII got into climbing on the Black Rocks in Derbyshire - aided with nothing but his mother’s clothes line, and how this led him to Everest in 1975. Proceeds from ticket sales for this evening will be shared by Hexham Rotary Club Disaster Fund and Community Action Nepal’s Earthquake Reconstruction Fund www.canepal.org.uk. 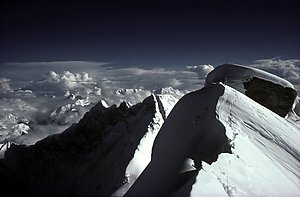 The evening will include a sale of Nepalese goods and an auction of signed framed mountaineering prints. Doug will show a short video about CAN and update the audience about the post-earthquake reconstruction of CAN’s projects. He will also be signing copies of his posters and books. Tickets: £15 / £12 Concessions (e.g. U18; student). Contact: Brian Massey mbmassey@waitrose.com / 01434 673413.